What are psychic abilities, and how can you develop your own and use them? People have been fascinated by psychic abilities for centuries. Those possessing these powers have been both revered and feared, and while mainstream science today may remain skeptical of the very existence of psychic phenomena, the police and other official agencies have made use of psychics to help further their aims. But what are psychic abilities really? 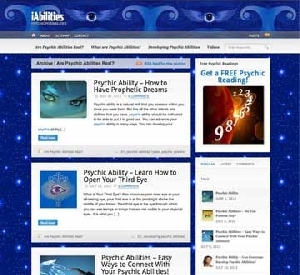 Featuring articles and other psychic info,this site is dedicated to help you to find out now.